Grim and gritty superheroics make a comeback - as if they'd ever left - in the just-released trailer for Marvel's new Spider-Woman motion comic. Click through for animated spies and whispered voiceovers. 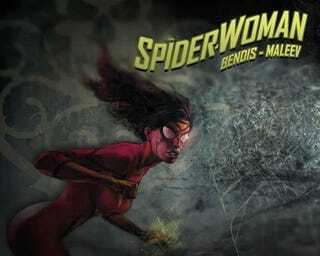 The long-delayed Spider-Woman - to be released simultaneously on iTunes and as a physical comic book - is written by New Avengers and Secret Invasion's Brian Michael Bendis, with art coming from his former Daredevil partner Alex Maleev; the first episode of the digital comic will be shown at San Diego Comic-Con at Friday's "Marvel Digital Comics... and Beyond!" panel.